Money For Sandbaggers? No Go, Says Fargo : The Two-Way It's sandbag season in North Dakota and Minnesota, where communities are banding together to keep the coming spring thaw from overrunning riverbanks and swamping towns. But one town's plan to pay sand-baggers has sparked anger across the river. 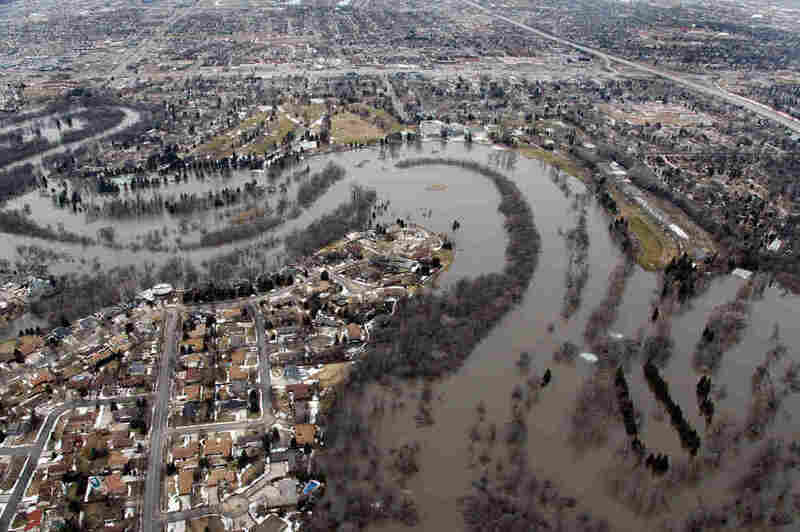 A file image shows the flooded Red River separating Moorhead, Minn., (right) from Fargo, March 2010. National Weather Service forecasters say that the chance for major flooding this year is above 90 percent. It's sandbag season in North Dakota and Minnesota, where communities are banding together to keep the coming spring thaw from overrunning riverbanks and swamping towns. But one town's plan to pay sand-baggers has sparked anger across the river. That's the story in Fargo, N.D., and Moorhead, Minn., towns separated by the Red River. As reported by Minnesota Public Radio, the announcement that Moorhead would spend around $160,000 to pay workers to fill sandbags caused a Fargo newspaper to bemoan its neighboring city's "apparent disdain for the community-building" that sandbags bring. As MPR's Dan Gunderson writes, "Fargo offers what are known as Denny's Bucks for bags, named for the Fargo mayor. Non profit groups earn $75 for every 100 hours volunteers put in filling sandbags." For anyone without a calculator, that's 75 cents an hour – pay that's roughly equivalent to that earned by a low-skilled Chinese worker in 2006, according to a Harvard Business Review article. The Moorhead plan calls for paying workers around $9 or $10 an hour – and that seems to have the folks in Fargo worried that their riverbank might not be as well-protected as that of Moorhead, to the east. That's a cause for concern this year — in January, the National Weather Service said that the chance for major flooding in the Red River Basin this spring is above 90 percent. In an editorial in the Grand Forks Herald Ryan Bakken says that paying sandbaggers is "wrong. So very, very wrong," with the explanation that the work not only protects houses but also builds a sense of common purpose. Bakken writes, "Whether their boots are made by Oshkosh or Ugg, all sandbaggers are equal." Still, things might work out just fine for Fargo: The town held a Sandbag Central rally on President's Day, and hundreds of volunteers showed up – even some kids from across the river in Moorhead. The town hopes to fill 3 million sandbags before the floodwaters reach Fargo, in about a month. Over in Moorhead, Mayor Mark Voxland says the town decided to pay workers to guarantee they would be on hand to man the town's updated sandbag machines. But Moorhead might run into some fresh problems in a few weeks. That's when the town will need to put up walls of sandbags to shore up the banks of the Red River. And it'll need volunteers to stack the bags, says MPR.